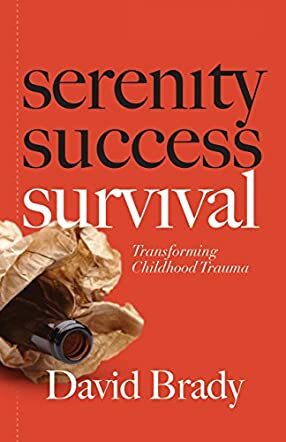 Survival: Transforming Childhood Trauma: 8 Steps to Reclaiming Your Life is a nonfiction, motivational self-help book written by David Brady. Brady’s childhood was, to all intents and purposes, an idyllic one. The family lived in a lovely home in Timmins, Ontario, where evergreen trees scented the air with their fragrance, and the mining which had given the town its start was still flourishing in the 1950s when Brady was growing up there. Unknown to his friends at the bar, his acquaintances and his co-workers, Brady’s father’s alcoholism was making his family’s life a continuing hell. Jack was physically and emotionally abusive to them, and, at one point, had pointed a shotgun at the author and his mom and continued pulling the trigger until Brady’s older brother intervened. The bright side to Brady’s precarious childhood was those summers spent with his grandparents on their farm near Cobalt, Ontario, where he played at being Tom Sawyer in his grandmother’s washtub and would float along and dream in the small stream on the farm’s property. That farm inspired him to embrace reading, beginning with Twain’s works and expanding outward to Hardy Boys mysteries and beyond. He and his mom did escape the dangers of living with his unstable and abusive dad, exchanging the countryside for the excitement of Toronto, and Brady found no shortage of friends and fun as he grew to be a young man, but something was always wrong. Indefinable to one who had had no formal training in psychology, Brady’s experiences growing up in fear had left a profound and continuing legacy upon his emotional well-being, one that would extend for decades until he was able to identify and take steps toward healing from the past. Brady shares his experiences as he healed, and he introduces the eight steps that helped him reclaim his life. He did so in the hope it would help other adult sufferers of childhood trauma realize that they too could reclaim the full rich lives they were missing due to those unaddressed issues from the past. David Brady’s book is an illuminating and compelling work that will have readers with unaddressed childhood trauma sitting up and paying attention. It will help those with traumatized people in their lives to finally understand what’s going on. I particularly enjoyed reading the first part, which is essentially the author’s memoir of his early years. While horrified at the treatment he and his family members silently suffered at the hands of Jack Brady, the author’s accounts of time spent at the farm, outdoors and, later on, with his friends as a teenager are beautifully written and a joy to read. I was also fascinated by his stories about his film-making, and I remember quite well how much I enjoyed watching The Grey Fox when it hit the movie theaters. His accounts of crashing and burning, of frantic, fear-filled nights wondering about the millions he owed creditors, and the slowly dawning realization that he needed help are eloquently and fearlessly shared with his reader. The eight steps he used to reclaim his life are clearly set out and the benefits he’s gained from his Master Mind groups are compelling indeed. Survival: Transforming Childhood Trauma addresses a continuing tragedy as childhood trauma survivors often live half-lives, never realizing their full potential, and it offers easily accessible steps to help those affected begin their own healing processes. It’s most highly recommended. Transforming Childhood Trauma: 8 Steps To Reclaim Your Life by David Brady is an uplifting and thought-provoking book that gives readers the assurance that all problems, challenges, and pain that we go through in life, because of coming from a dysfunctional family background, have a solution. The book is a useful tool for giving good support to people who want a healthy transformation. The author's personal problems with drugs and alcohol, and his failures that later on led to his successes, are inspirational. The author also shares some spiritual practices and the eight steps of the Master Mind Principles which can be practiced by anyone, irrespective of their faith. I found the book motivational and profound, and the author's experiences are relatable and tangible. The book will make readers question every aspect of their life and will lead them to finding answers to the questions that have lingered and bothered them. The book will help readers rediscover themselves and also help them to take a trip into their inner selves. The eight steps highlighted by the author - I Surrender, I Believe, I Am Ready to be Changed, I Decide to be Changed, I Forgive, I Ask, I Give Thanks, and I Dedicate My Life - are all helpful in achieving transformation and spiritual progress. They are easy and simple to practice and incorporate into one's life. This book is definitely for all those who have gone through and are going through difficult phases in their lives and want to change.